Sidney Ohio bed and breakfast GreatStone Castle Resorts, near Dayton, OH. This magnificent bed and breakfast mansion, on the National Register of Historic Places, has endured for ten decades as an Ohio landmark. 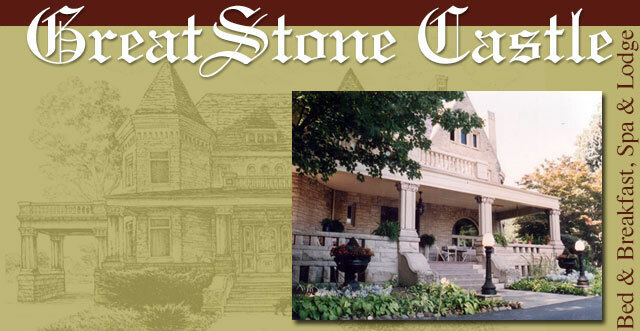 The GreatStone Castle Bed and Breakfast is constructed of Bedford Indiana limestone, 18 inches thick, and features a wrap around porch supported by intricate stone columns. Three turrets give this massive structure its castle-like appearance. Interior design results in elegance and comfort. GreatStone Castle Bed and Breakfast is finished in rare hardwoods from various countries, transported by sailing ship and rail, to their final destination atop a hill in Sidney, Ohio. Overlooking historic downtown Sidney, two acres of lawn, gardens, and 100 year-old oaks greet all who approach by the scenic circular drive. With over 4,200 square feet on each of four levels, GreatStone Castle Bed and Breakfast is suitable for many activities. First floor ballroom, banquet, and turret rooms are ideal for weddings, receptions, parties, and corporate off-site meetings. Fresh fruits and pastries are served in the conservatory. The second floor hosts the bed and breakfast suites. Private baths, Victorian furniture, and fireplaces are available. There is also a private Lodge and Retreat available. Lower level hosts a spa complete with hydrotherapy and technicians offering a wide range of services. Relax in our gardens, on the front porch swing, or tour the entire air-conditioned GreatStone Castle. GreatStone Castle Resorts also offers Canal Lake Lodge, a private lodge, lake and 100 acres of woods, for overnight guests or special events. Website design, hosting & promotion by Blizzard Internet Marketing, Inc.